The Kalmar Light Capacity Rough Terrain Forklift (LCRTF) excels in some of the harshest conditions in the world. 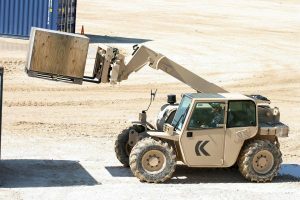 The sturdy forklift’s durable design and powerful Perkins engine make it one of the most reliable, ultra-tough pieces of machinery for missions in tough environmental conditions – and the defense industry is taking notice. This compact, material-handling forklift is ready to take on challenges in difficult weather conditions and worksites where other equipment would not be successful. 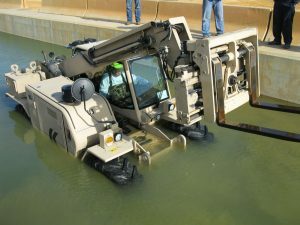 Powered by a Perkins 1100 series engine supplied by our team, the LCRTF has a 14-inch ground clearance and can operate in up to 36 inches of water. These features prove extremely useful in military applications, where infrastructure is underdeveloped or nonexistent and uptime is key for mission completion. The Department of Defense has turned to the LCRTF for its ability to operate in environmentally challenging situations, where durability and unmatched engine reliability are essential features to get the job done. 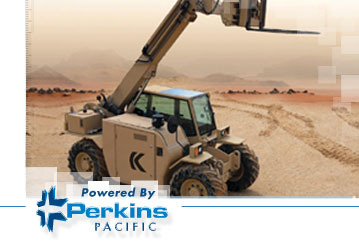 The LCRTF provides operators unmatched performance, thanks to its Perkins engine that’s well-suited to handle the demands of minimal infrastructure while also powering its materials handling capabilities. This forklift goes where other equipment cannot – a prime example being the Department of Defense’s recent use of an LCRTF in the remote town of Harper, Liberia. The delivery of the LCRTF took place during the treacherous rainy season which creates the worst road conditions of the year, and a delivery truck was unable to make the trip. Over two days, the LCRTF was successfully driven over the 200-mile road to Harper from Zwedru.